I got out of the car early Sunday morning, walked to the boardwalk, and down a path to the beach. A scan to my west with the dawn light behind me revealed a Snowy Owl sitting behind some beach vegetation, way down the beach. A black corvid was dive-bombing it and though the black bird looked big I figured it was either an American Crow or a Fish Crow. They were so far down the beach that I could neither hear the bird nor see it well enough to decide what, exactly, it was. I wasn’t too concerned though because the cool part of the interaction was a Snowy Owl near at the end of March, a time of year I associate more with early migrants like Eastern Phoebes, which I still haven’t seen this year, or Piping Plovers which I also hadn’t seen until I stopped staring into my scope and looked much closer to me. 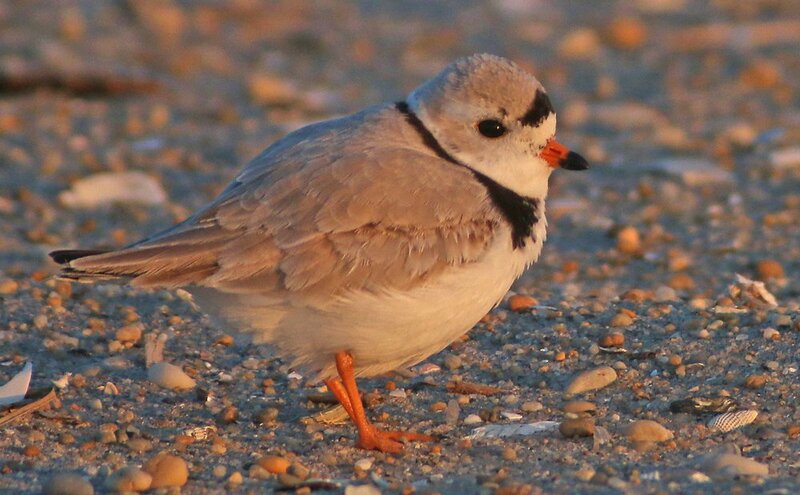 My first Piping Plover of the year, one of three I would find on my beach walk. I watched the plover for awhile until a loud croaking noise interrupted my attention. That sounded like a raven! And, sure enough, I was right to think that the corvid that had been dive-bombing the owl looked big: it was a Common Raven and now it was flying along the boardwalk right past me! 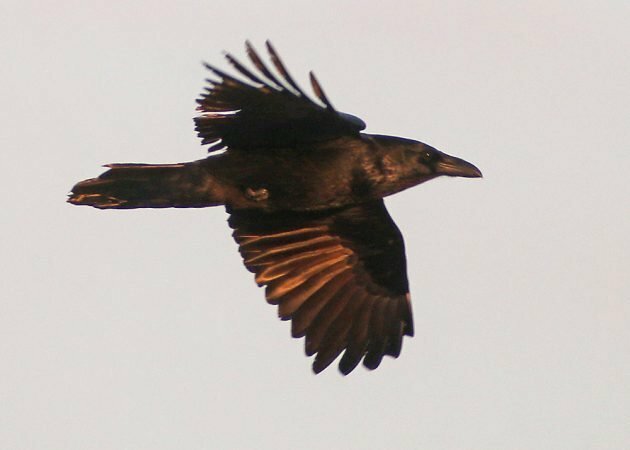 Ten years ago a Common Raven in Queens was an amazing sighting. Now they are seen with regularity. A Piping Plover, a Common Raven, and Snowy Owl. That’s an odd trio for the end of March on the beach in Queens. 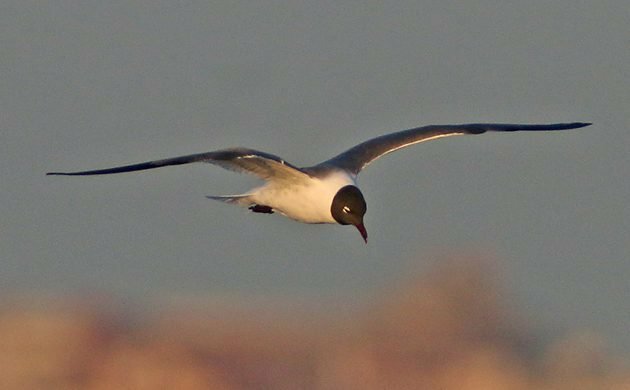 And, look, my first Laughing Gull of the year. (It’s up at the top of the post.) But what really stole the show for the day was the horde of American Oystercatchers that are back in numbers and quibbling and quarreling over which pair will get which section of beach to breed. They stayed busy chasing and yelling and generally carrying on. Some of them looked rather bedraggled, probably recent arrivals who had to battle the wind all the way north this year. This bird just looked exhausted with its droopy wing and willingness to allow close approach. 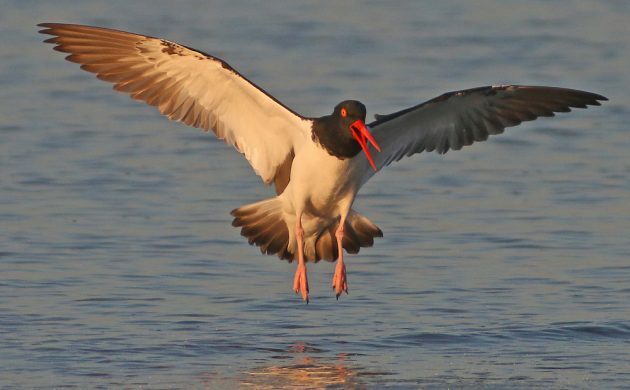 In addition to the oystercatchers on the beach I watched a trio flying high heading east, likely to breed somewhere in Nassau County or points further. 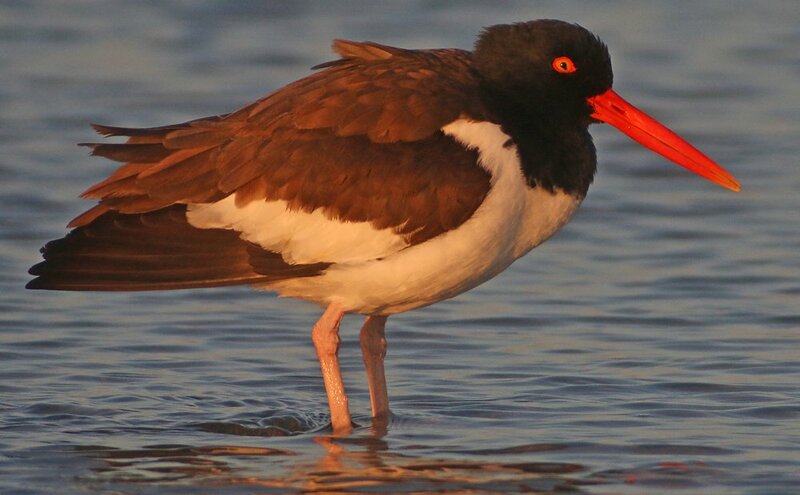 Though I spotted my first of the year a couple of weeks ago this was the first day this year that I had seen oystercatchers in real numbers and it was nice to remember just how fun it is to have carrot-nosed shorebirds on the beach. What’s not to like about a sight like this? Though I spent a bunch of time paying attention to oystercatchers I was also scanning through gull flocks and then I watched a small flock of Mallards rather oddly feeding in the surf. Then everything scattered so I immediately started scanning for a Peregrine Falcon. 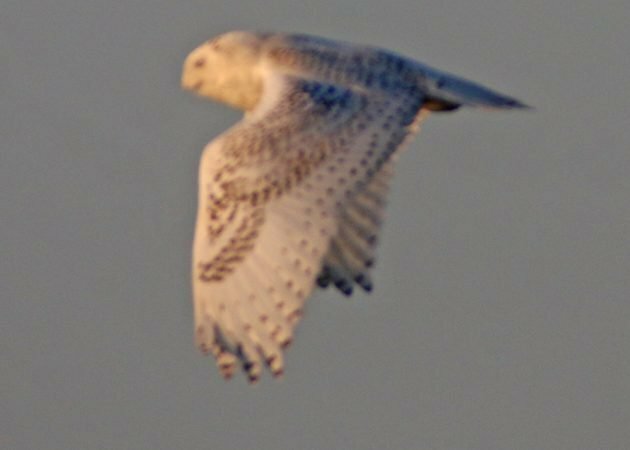 Instead the Snowy Owl flew over and headed out to sea! Yeah, I missed the focus. Dammit. Though it was a great morning on the beach I must say that my continued failure to find an Eastern Phoebe this spring has been rather disappointing. Is it weird that I’m obsessed with that instead of being happy about Piping Plovers? How’s migration going wherever you are? Pretty nice set of birds! The shorebirds are getting coloured up and feeding up ready to go north! You Want to See a Lucifer Hummingbird, Don’t You?